Low patio decks are built for a flat lot that has little or no change in the grade of the land. Therefore, low patio deck plans don’t include a lot of stairs taking you from the deck to the backyard. They are a great option if you have small children or older adults living in your home. This style of deck allows the homeowners to easily connect the backyard to the space inside the home. 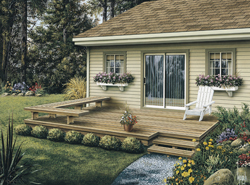 Our collection of low patio deck plans includes many styles and sizes perfect for your backyard and outdoor lviing area. We offer detailed blueprints that allow the buyer to visualize the look of the entire finished project easily. With a wide variety of plans, we are sure that you will find the perfect do-it-yourself project to fit your needs and style.